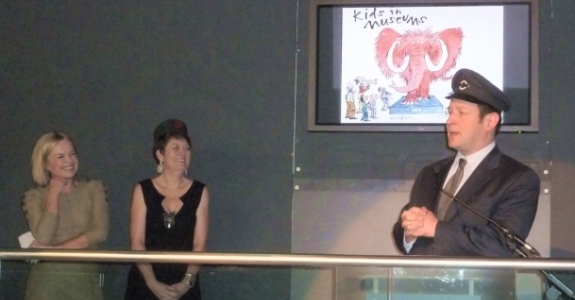 Dea launched the 2011 Kids in Museums Manifesto last night – wearing a splendid titfer in recognition of the event’s location at the London Transport Museum. Mariella Frostrup, patron of the charity, spoke about museums’ power to promote intergenerational relationships (and the fact that she’d passed up an invite to the Golden Globes from Colin Firth to be with us for the evening). Head of the Waterfront Museum in Swansea, Steph Mastoris, then made a bilingual speech marking the fact that this year’s manifesto is available in Welsh as well as English for the first time. Ed Vaizey, Minister for Culture, Communications and Creative Industries, gave the new 20-point manifesto its official welcome. It might be an unusual sight for a Conservative MP to share a platform with a Guardian journalist, he said, donning a natty London Transport cap. But the Kids in Museums campaign, with its focus on making museums accessible and meaningful to everyone, is something with which we can all get on board.